Jordan Peele strikes gold combining "Guess Who's Coming to Dinner" and "The Stepford Wives." WASHINGTON — Jordan Peele may be best known for his comedy duo Key & Peele, but his favorite genre has always been socially-conscious horror that both thrills and teaches. Enter his directorial debut “Get Out,” currently No. 1 at the box office, marking the first of five social thrillers that Peele has planned for Blumhouse Productions (“Paranormal Activity”). Get out to the theater immediately; it’s not only one of the best horror flicks in years, but one of the best movies period. Then go see it again. With all due respect to legendary film critic Pauline Kael, who never saw a film more than once, “Get Out” repays with repeat viewings. 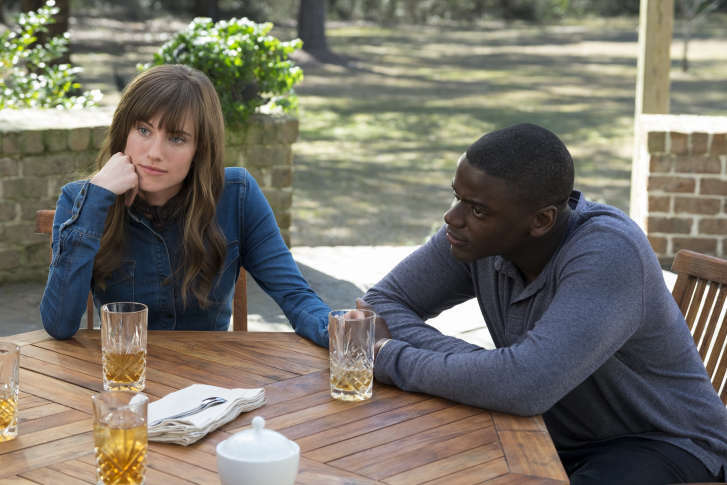 The premise follows a young African-American photographer, Chris Washington (Daniel Kaluuya), who joins his white girlfriend, Rose Armitage (Allison Williams), on a trip to “meet the parents.” Her eccentric folks, neurosurgeon father Dean (Bradley Whitford) and therapist mother Missy (Catherine Keener), claim to be open-minded despite off-color jokes, but the longer Chris is there, the more he realizes something isn’t right at the secluded family estate. It’s “Guess Who’s Coming to Dinner” (1967) meets “Rosemary’s Baby” (1968) and “The Stepford Wives” (1975), featuring the interracial social graces of Sidney Poitier, the slow-burn covens of Roman Polanski, and the suburban chills of Katharine Ross in trophy-wife Connecticut. Peele embraces these elements in loving homage, feeling less like a ripoff and more like a 2017 update on where we stand today — a cinephile’s stab at chilling social commentary. Penned during the early Obama administration, Peele claims he was inspired by idealistic progressives who claimed we live in a “post-racial America.” After taking years to reach the screen, “Get Out” is more timely hitting theaters in 2017, as racial and political divisions have only grown, revealing the underlying tensions that Peele saw beneath the surface all along. The key to Peele’s success is his spot-on casting, combining reliable screen veterans with impressive newcomers that invite our empathy — and fear — in their proper proportions. Daniel Kaluuya (“Sicario”) is a revelation, navigating the nuances of modern interracial dating while dealing with folks trying way too hard to sound inclusive and “down with the cause.” He uses subtle glances to show viewers when he’s uncomfortable, whilst putting on a polite front for his fellow on-screen characters. Most impressive are his emotional therapy scenes, shedding tears over a childhood trauma while convincing us that he’s actually hypnotized. Equally stellar is Allison Williams, daughter of NBC’s Brian Williams and star of NBC’s “Peter Pan Live.” She earns our sympathy early on by defending Chris against a cop’s racial profiling. As the thriller progresses, she stands her ground with a truly unforgettable performance. Still, her on-screen parents steal the show. Just as Peele straddles comedy and horror, Bradley Whitford has proven he can do both with “Billy Madison” and “The West Wing,” as has Catherine Keener with “The 40-Year-Old Virgin” and “Capote.” In “Get Out,” Whitford terrifies by staring into a hellfire fireplace and flashing hand signals at a gazebo, while Keener stirs a tea cup with a hypnotic, rhythmic motion that becomes a centrifugal force of terror. Just as Angela Lansbury said, “How about some solitaire?” in “The Manchurian Candidate” (1962), Keener achieves similar creep factor saying, “How about some tea?” before plunging us into a mental state known as “the sunken place.” On screen, it looks like Kaluuya falling slow-mo into endless darkness, while Keener watches from a rectangular window that serves as his out-of-body P.O.V. — a genius callback to Keener in “Being John Malkovich” (1999). Peele’s vision is on display right from the opening, which should be taught as textbook horror. A black man (Lakeith Stanfield) walks a shadowy, suburban street pursued by a slow-moving car playing “Run Rabbit Run” in upbeat counterpoint to the suspense. We’re terrified by what’s outside the frame, topping M. Night Shyamalan’s “Split” as the year’s freakiest intro. Peele continues his master manipulation with glimpses of the family’s house servants, be it Marcus Henderson’s groundskeeper sprinting like Jesse Owens or Betty Gabriel’s maid staring at her window reflection. Such moments are simultaneously symbolic and undeniably creepy, as Gabriel passes doorways for all the jump-scare jolts of “The Sixth Sense” (1999). You’ll feel like a deer in headlights, so transfixed on the screen with your fingernails digging into your chair, that you may miss Peele’s double meanings. Note the red Lincoln in the first scene; the blue and red-and-white striped shirts forming an American flag; the key moment of picking cotton; colorful fruit loops separated from white milk; and the way that cell-phone cameras help African Americans fight back with Canon lenses as the new Civil War cannons. This is symbolic mise-en-scene at its finest. Few films repay this much on repeat viewings. Either way, the subversive final scene is a social statement disguised as a culminating pun. We’re ultimately spared, but our gasp is telling. This is highbrow commentary masked in lowbrow genre. “Get Out” isn’t a spoof like Wes Craven’s “Scream” or Wayans’ “Scary Movie;” Peele isn’t satirizing the genre but society at large. Bring on his next four social thrillers! His fresh formula, in such a mainstream genre, could change hearts and minds with mass appeal. In other words, this genre-bending filmmaker might just change the world one thrill at a time, without many folks even consciously knowing it. He’s one to watch. Keep your eyes Peeled.